Whisk egg yolks and sugar until light and fluffy. Beat in dragon fruit puree, corn oil and essence. Lightly mix in self-raising flour and cornflour. In a separate clean bowl, whisk egg whites, cream of tartar and castor sugar until fluffy and stiff. Carefully fold the egg yolk mixture into the beaten egg white until well combined. 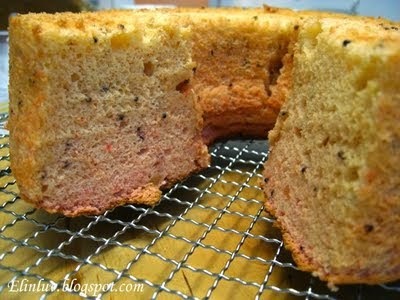 Turn batter into a 16cm chiffon cake pan. 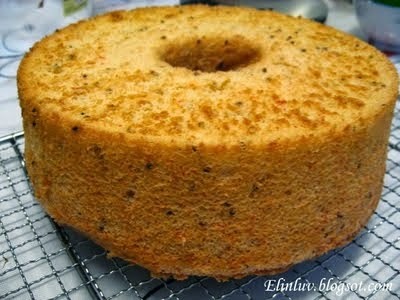 Bake in preheated oven at 170°C for 40-45 minutes or until a skewer inserted in the cake comes out clean. Remove from the oven and invert pan immediately. Leave undisturbed until completely cooled. 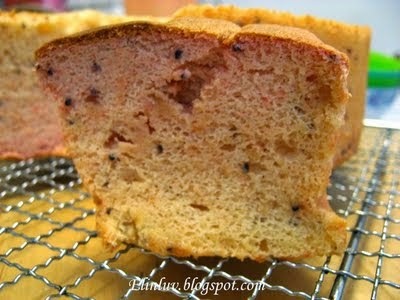 Hi Elin, tried baking this chiffon but the lovely dragon fruit colour changes and not prominent. Still trying to find the answer. Agree it tastes good.